A key selling point of the Republican-crafted state budget is that it somehow boosts municipal grants modestly while still closing huge projected deficits. But Gov. Dannel P. Malloy’s administration charges that extra aid is fiction — “gimmickry” that understates last fiscal year’s local aid to make new levels in the GOP plan look larger by comparison. 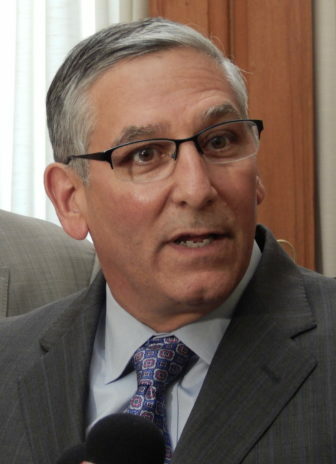 Senate Republican leader Len Fasano countered the municipal aid growth in the Republican plan is real. The North Haven lawmaker also urged Malloy to sign the GOP budget, noting it passed with bipartisan support nine days ago while the governor’s plan was passed over. At issue is a state program that capped motor vehicle taxes last year in 18 cities and towns and in 12 fire or other service districts with tax rates greater than 32 mills. Connecticut sent these higher-tax-rate municipalities $51.9 million last fiscal year to offset some of the revenue lost because they had to lower tax rates on vehicles to 32 mills or $32 for every $1,000 of assessed value. The Republican budget ends the capping system and eliminates the compensating state payment. But the GOP went a step further. The state payments never made up for all the revenue the municipalities lost under the cap, according to nonpartisan analysts, who determined communities came up $61.4 million short. Malloy objected to the $61.4 million loss being subtracted by OFA from the total municipal aid tally in the GOP budget. And while overall municipal aid under the GOP plan does not grow unless last year’s funding is reduced by $61.4 million, Donnelly also noted that state aid to some communities shrinks in the new budget — contrary to the GOP’s message. The $61.4 million question is critical when determining whether the Republican plan actually increases state assistance to municipalities. The GOP would boost major education grants by 3 percent this fiscal year compared with last, and drop established, non-education programs — which are much smaller — by 21 percent. Add up the numbers and the existing, major aid programs would send $2.67 billion to communities this fiscal year, about $34 million less than they did last year. The GOP added a new $33.6 million “stabilization” grant with the intention of closing that gap. But the schedule of overall local aid in the Republican budget shows an increase of $62.5 million. Most of that growth happens only by subtracting the car-tax-capping system’s $61.4 million from the $2.71 billion the state actually paid out to municipalities last fiscal year. The Malloy administration argued Republicans cannot arbitrarily pick one program that imposes burdens on cities and towns and subtract those costs. The state currently has two PILOT (Payment In Lieu Of Taxes) grants that reimburse communities for only a portion of the revenue they lose because property owned by the state, private colleges and nonprofit hospitals is tax-exempt. Why, administration officials asked, doesn’t the Republican plan — which retains but reduces the PILOT grants — calculate the losses this system imposes on communities, especially for this fiscal year and next? Fasano countered that the governor had no problem in February proposing that cities and towns be allowed to tax nonprofit hospitals’ real property — and then listing that as a form of state aid to municipalities. “This argument is ‘Malloy Math’ made by someone who has led our state into tax increase after tax increase followed by deficit over deficit,” Fasano said, adding that Democrats proposed the car-tax-capping system two years ago despite state budget deficit forecasts that showed Connecticut could not sustain the promised payments to capped communities. 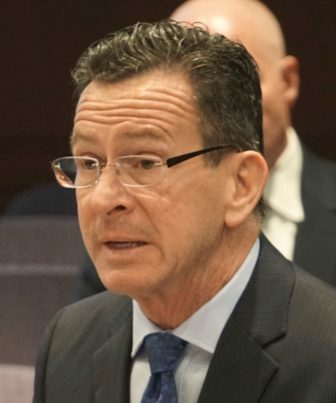 The new two-year budget that Malloy and his fellow Democrats in legislative leadership recommended reduces most major education grants by about $107 million this fiscal year compared with last. Non-education aid is re-organized and reduced by $13.5 million. That package includes a new, $46 million emergency “municipal restructuring” grant to assist Hartford and other communities at risk of insolvency. The GOP plan has no emergency aid — one of the reasons Malloy says he intends to veto that budget. The governor also questions whether other cost savings that help the Republicans pump more money into cities and towns actually can be achieved. The Republican plan would unilaterally reduce state employee pension benefits after mid-2027 and reap some of the savings now, reducing pension contributions by $321 million across this fiscal year and next. Malloy and union leaders have said they believe this is legally risky, would almost certainly be challenged in court, and constitutes bad-faith bargaining on the state’s part just months after unionized workers agreed to major concessions. The GOP plan also orders the governor to achieve $260 million more in savings after the budget is in force than the plan Malloy and Democratic legislative leaders proposed. And while the governor is urged to find those savings by combining agencies and reducing executive appointments, some legislators argued that won’t produce enough savings, putting promised municipal aid levels at risk.